Home » ★★★★☆ » THIS RESTAURANT IS DECEASED : The Newman Arms. Not your average boozer. No, it’s not the Newman Street Tavern, a hop skip and a jump away, around the corner, on Newman Street but you’d be forgiven for being confused by this two Newman-named gastropubs malarkey. I did that old-fashioned thing and phoned to book. There was none of usual Sisyphean endeavour needed to speak to an actual human at the latest fashionable feeding hole and I spoke to a real person straight away. Tick. The Newman Arms in its current incarnation is the brainchild of Matt Chatfield who has, according to the website, spent the last five years putting together a team known as “The Cornwall Project.” His aim is to share Cornwall’s best with the rest of the country and this pub/restaurant in Fitzrovia is their showcase. There’s a butcher, a salad-grower, a fishmonger and a dairy, so most bases are covered. And the produce comes up daily, delivered after your bedtime, at 1am. There are plans to offer bespoke meals to customers, so you might be able to order your favourite fish, in advance. My inner control-freak is making plans, even now. The wine list, which deserves special mention, is not populated by offerings from Cornwall but hails instead from the brain of Zeren Wilson, blogger and wine consultant, a man who knows his grapes. What I really love is that my wine is served at the perfect temperature, in a fine, delicate glass of excellent quality. How simple that is to get right and and how often restaurants fail to do so. It’s an interesting pub, the Newman Arms, having been a tavern since 1830 and not only that, a brothel. There is, I am given to understand, an image of an “old-fashioned” prostitute painted onto a bricked-over upstairs window that unfortunately I failed to spot. The Newman Arms allegedly also made an appearance in two of George Orwell’s novels, Nineteen Eighty Four and Keep the Aspidistra Flying. Slightly more up to date, the passage at the side of the pub was featured in the opening credits of Minder and I mean the original Minder, mind you. There are all sorts of stories about this pub, but I particularly like the one about a previous publican having to serve drinks more slowly in order to deal with complaints about too much rowdy on-street drinking. Because that would really work. The ground floor is a trad pub, tiny, dark and bustling. I imagine it hasn’t changed for some considerable time. It feels like there are decades of nicotine and beer fumes trapped in the walls. It is no wonder there was (and still is) much on-street drinking as there is is not enough room to swing a cat, not something you’d ever see me attempt. Up some rickety stairs to a bright, airy room, oozing with character due to its wood panelling and pretty lead-light windows. Tip: in daylight ask for a window table. 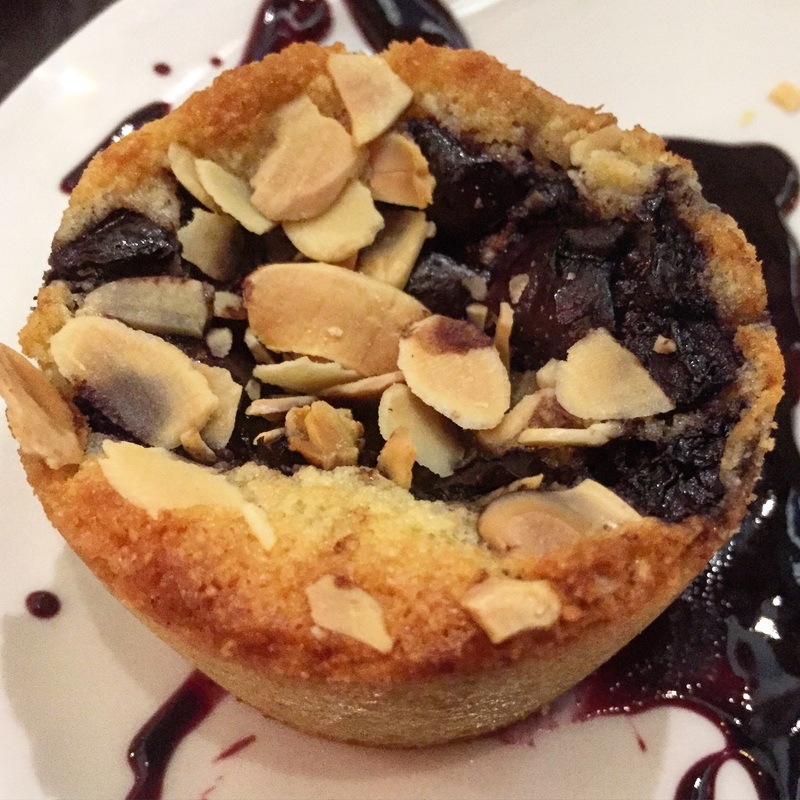 The menu is short and sweet, with only three starters, four mains and a single dessert. I faff about with my main, not able to decide between the turbot and the romanesco. I ask the cherubic waiter whether I can have the romanesco as a starter. There is consultation and I am not hopeful but angel-boy returns and tells me the chef will do the romanesco as a side dish to my turbot. So effectively I have another course as well as the starter I really wanted and we are all happy. 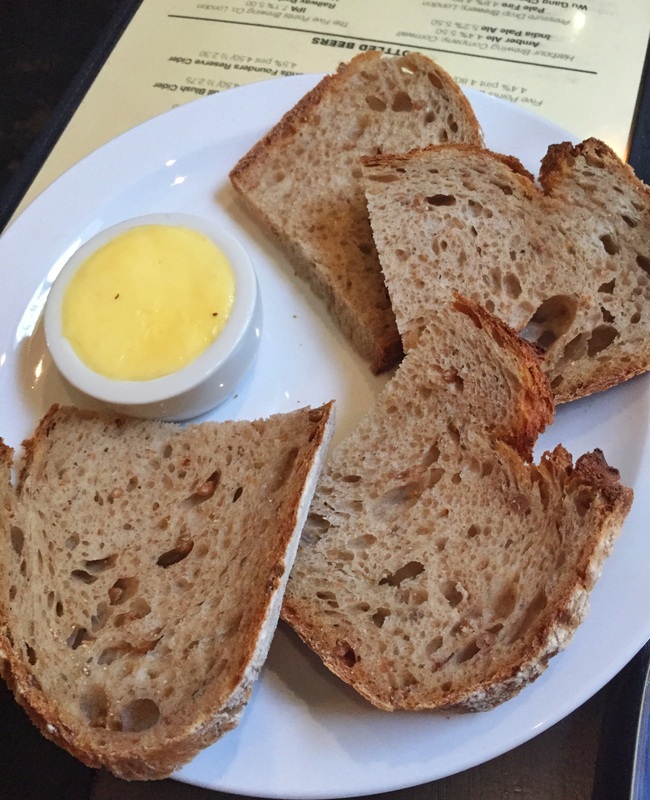 There’s good bread, plenty of it and at no extra charge. 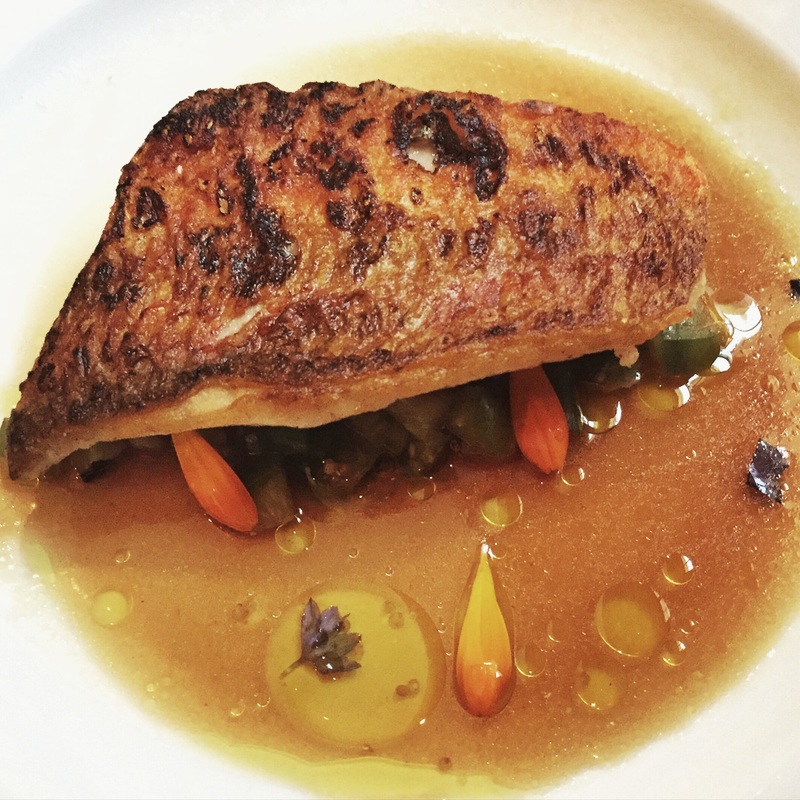 It mops up the vinaigrette of the red mullet, tomatillo, broad beans and vinaigrette (£8) a portion almost big enough to be a main. The fish is crisped to perfection, the tomatilloes adding bite under the warm, semi-sweet dressing. Pretty petals are scattered over the plate. Tomatilloes, in case you are wondering, are like unripe tomatoes, perfect in a salsa. 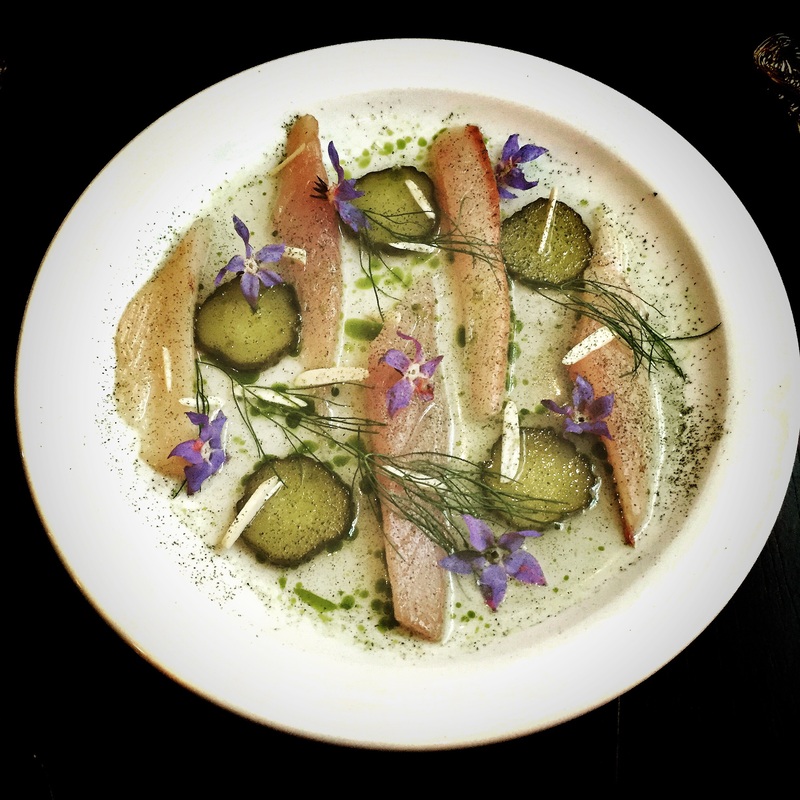 My companion J ordered the mackerel and fermented gherkin with fresh almonds, a gorgeous plateful, strewn with fennel fronds and tiny purple flowers. 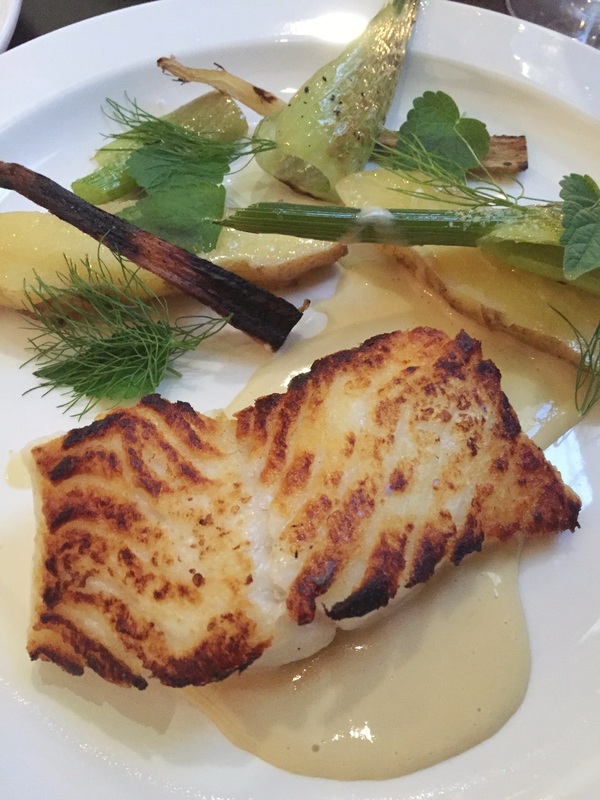 My turbot came with baby fennel, smoked pink fir potatoes and an olive sauce. The fish, on the very edge of burnt and gloriously moist beneath, fell apart in huge flakes. The potatoes were firm and waxy and the fennel added crunch. The olive sauce was so subtle that you wouldn’t know it was olive, but not in a bad way. 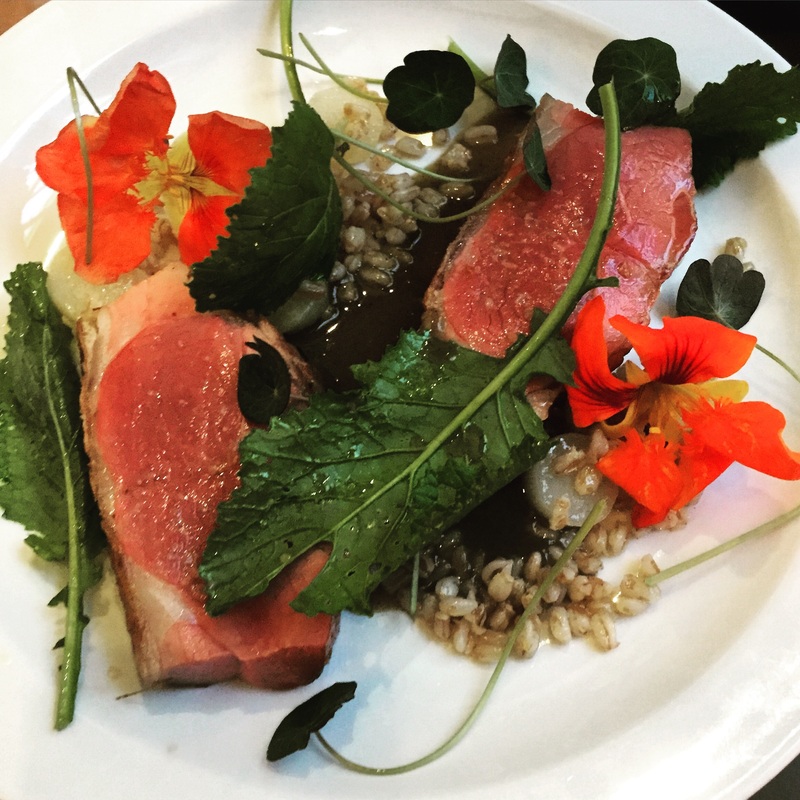 Likewise, J’s enormous plate of sous-vide lamb and smoked spelt was a great combination of fresh and raw, smoked and tart, with an interesting seaweed sauce giving a lift to the lamb.The whole thing showed a really sure hand in the kitchen. 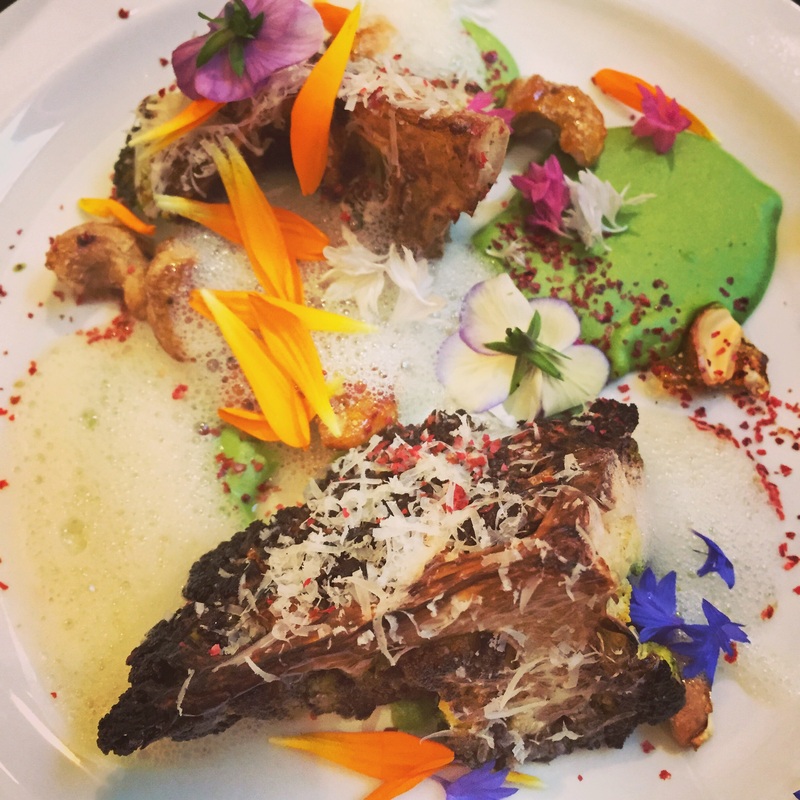 The romanesco-on-the-side came with a veritable bouquet of flowers strewn over a plate of pink peppercorns, cashew nuts, Old Ford cheese and cider sauce. It was the girliest plateful I’ve seen in a long time and I loved it. As there was only the one dessert we felt it would have been rude not to. It was so good I asked J if we could order another one, before the first mouthful was even down my throat. J has lost rather a lot of weight this year and wants to keep it off, so he demurred and there was no way I was going to deal with the reality of my greed, but a day on I regret my restraint. The vanilla ice cream which accompanied it was worthy of separate billing. Judgement: I love the Newman Arms because it has heart and soul, it uses the very best ingredients and messes about with them just enough. The cooking is sophisticated and modish but not so as to put off your more traditional punter. The food looks gorgeous and I love the use of flowers in every dish. The room is ramshackle and charming and when I was there only half the tables were occupied. I suspect that won’t last, not at these prices and with this level of cooking. It may have been the Proles Pub in Nineteen Eighty Four but the cooking here is top class.